The Rowenta DW8080 Master Pro steam iron is one of the more popular models from the brand, but it comes at a low price. It features a stainless steel sole-plate with 400 steam ports made to deliver steam evenly across the entire plate. It features a self-cleaning system and anti-calc system to help clean the iron of build-up and help maintain its condition. The extra-large water tank can accommodate 12.7 ounces of water, and it holds more than any other iron from Rowenta. The Rowenta Pro Master iron has a large-capacity water tank capable of holding 12.7 ounces of water. This is one of the largest capacities for models of this class. If you use just a little steam, it can last throughout the ironing session. It comes with a pouring cup to make refilling much easier. 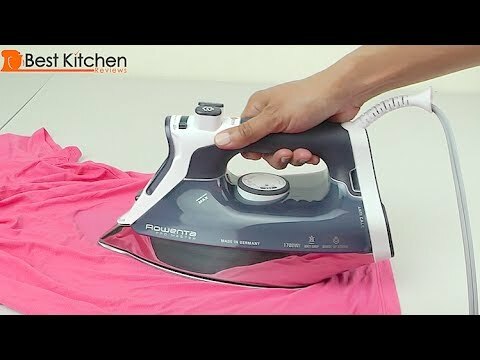 The powerful steam bursts the Rowenta Master iron can produce allow it to also work well for vertical steaming of clothing and drapes. The Rowenta 8080 produces a powerful steam output, but this also means that the tank will need refilling more often due to the amount of steam released. Many users report having an issue with water leaking out. The dark blue color of the tank makes it difficult to monitor the remaining water levels. The Rowenta Pro Master features a self-cleaning process that flushes out impurities that may cause damage or affect ironing results. The anti-calc system collects scale in the tank and helps prevent calcium build-up in the device. This will allow your iron to operate more efficiently and last longer down the line. One of the best benefits of the Rowenta DW8080 is the fact that it heats up in as little as under a minute. There is also a light that indicates when the iron has reached the desired temperature. The Rowenta Master iron provides a three-way automatic shut-off feature that powers down if the iron has been left idle for a specified length of time, and this is also indicated by the light. One of the more impressive features on this iron is the large capacity of its water tank at 12.7 ounces. If you’re careful with how much and how often you use your steam, you can avoid having to refill repeatedly like you would with other steam irons. This Rowenta professional steam iron is on the heavier side with a larger build compared to many similar models. This size and weight come from the fact that it has its large water tank and thick handle, and such factors may be a problem for those prone to aches in the hand when holding devices. The handle still features a soft round lining to make gripping more comfortable. Like other Rowenta irons in its class, the Rowenta DW8080 features a stainless steel microsteam sole-plate. This non-stick plate is scratch-resistant to allow for a smooth glide across various fabrics. It features 400 steam ports to help evenly distribute steam to get the neatest press. The unit also features a precision tip to help maneuver the iron in difficult areas. As detailed in the Rowenta DW8080 review, this iron provides many features usually only seen in high-end models. If you prefer more advanced features but don’t want to spend too much, this Rowenta iron may serve as a nice middle-ground.